Create With Me: Spooky crafts from the past!!! These projects sure are keepers, Julia! Thanks for sharing them again! 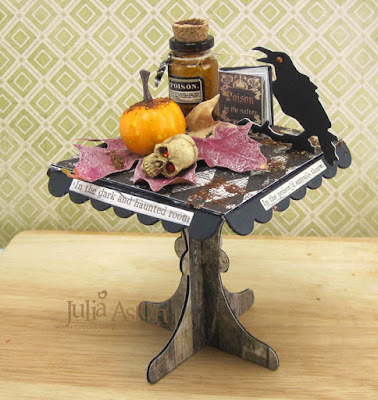 I remember the spooky apothecary table you posted last year, Julia! This is so cool! It takes time to make each item and put them together, but you can enjoy the table every year. I love your 3D projects! fabulous...love all your wonderful creations! so spooky! You are so creative Julia and you have such talent with your 3D mixed media projects. A real inspiration x Thank you x. 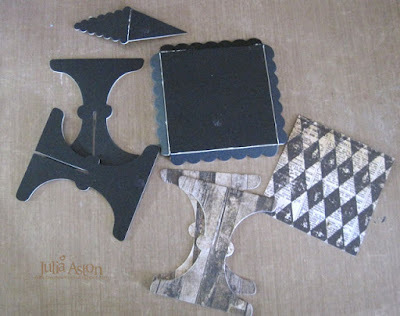 You are always finding such cool ways to use these dies Julia! Love these two creative Halloween projects- glad they are able to be set out each year! I was just about to protest that I was sure I'd commented here, and then I read it properly to see that yes, of course I was right to think I remembered that fantastic Cake Stand... it's just from longer ago than I could have imagined. Where does time go to? Sorry to have missed so many great posts... but I'm glad I've had a bit of catch up time, and I hope to get back in the swing of things a bit over the winter.